In our household we use a lot of ginger and turmeric. In fact we have it every day with a juice of green apples and lemon. 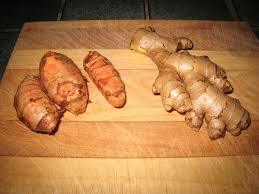 The biggest problem with both ginger and turmeric is that it is quite expensive. By chance one day I had about a thumb sized bit of ginger and I planted it in a pot near the back door. The pot got watered with all the other pots around it and I forgot about it. Come the beginning of summer and I noticed these strange shoots coming up. I left them to develop and a few weeks later had a bit of a dig around at the base of the shoots. Much to my amazement and delight there was enough ginger there to cover my hand. Encouraged by this success I planted several pieces of turmeric and once again the same story as the ginger. I now have a pot full of ginger and of turmeric. What I do is pick the ginger and turmeric as I use it. Ginger or turmeric straight out of the ground is just so different to what you buy in the shops. It’s stronger and the smell is just so much more. If you decide to do what I do make sure that the soil in the pots is well drained and easy to dig in. I suggest a mixture of 1/3 potting mix and 2/3 soil. Potting mix alone does not have any structure and nor does it hold water. On the subject of water, water your pots regularly every 2 to 3 days and make sure that the excess water will drain from the pots. Give it a go. 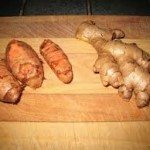 Once you have your own ginger and turmeric you will never go to store bought ginger and turmeric again.